State Sen. Doug Ericksen projects a surprisingly rosy view of the recent election in Cambodia, which the U.S. government and many others have condemned as unfair and undemocratic. What’s his deal? Washington state Sen. Doug Ericksen really wanted to show me a video on his phone. “I’ll see if I can find this one here — how they campaign in Cambodia,” the Ferndale Republican said, as I squinted in the sunlight to make out what was on his screen. It was a political parade on a Cambodian street, which Ericksen filmed during his visit to observe the country’s July 29 election. I’d spent the previous two weeks trying to figure out why Ericksen had agreed to travel to Phnom Penh, Cambodia, to serve as an election observer. After all, the U.S. government, which concluded the vote would be anything but democratic, had pulled its own monitors and financial support for the election. Was he aware of reports that Cambodians were being coerced to vote? Did he serve as an unwitting pawn for the ruling Cambodian People’s Party, which had ensured there was no real opposition on the ballot? His legislative office had also denied my public-records requests for documents surrounding his travel. But the senator — who is in a tough battle for re-election — later had a change of heart, emailing me to suggest we meet in person. So I drove 90 miles north on Interstate 5 to meet Ericksen at Woods Coffee, a cafe located on the waterfront in Bellingham’s Boulevard Park, just outside his district. Though I arrived on time, he was already waiting for me. And I was waiting for some answers. What Ericksen said next surprised me even more than his offer to meet. “I think it was very free, very fair, everybody got a vote,” Ericksen said about the widely condemned Cambodian election. In these moments and others, Ericksen seemed extraordinarily sympathetic to Cambodian Prime Minister Hun Sen’s strongman government. I asked him several times how he could know for sure the elections were truly free and fair. As one piece of evidence, Ericksen cited the Cambodian election’s 83 percent turnout — a highly suspect number — which he compared favorably to the 40 percent turnout in Washington state’s August primary. While showing me the parade video, he said a high-energy mood permeated the streets leading up to the vote. Ericksen said he traveled between polling places with an interpreter supplied by the Cambodian National Election Committee, a group dominated by members of the ruling party. Still, the voters he talked with seemed “genuinely enthusiastic,” he said. He said Cambodian government officials invited him to come observe the election in May, during his second trip to the country to discuss trade. Yet he insisted he paid his own way. While a third-party group had offered to reimburse him for his airfare — about an $1,800 value — he wasn’t sure he would accept, he said. He wouldn’t tell me who made that offer, except to say it wasn’t the Cambodian government. After about 90 minutes, I still wasn’t sure why Ericksen thought this trip was a good idea. I closed my notebook and thanked him for his time. It didn’t occur to me until I was driving home that Ericksen might have been angling for a job. 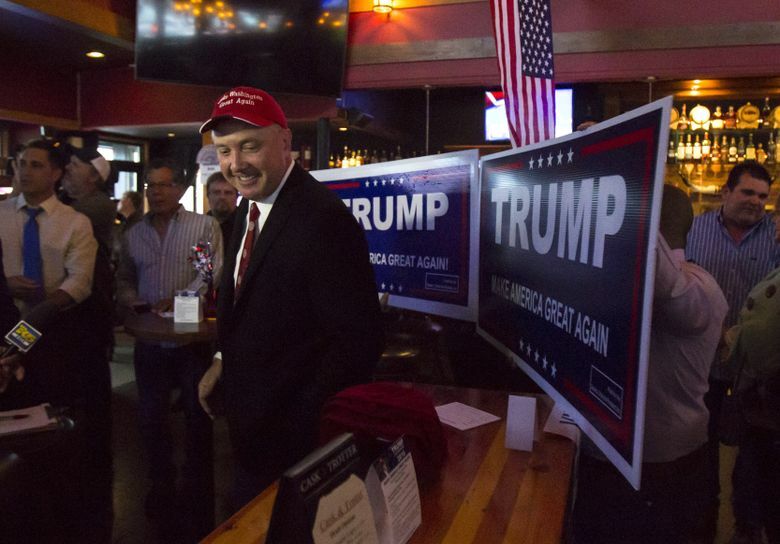 A former leader of President Donald Trump’s campaign in Washington state, Ericksen previously has expressed hope he would secure a position in the Trump administration. At the time Ericksen was in Cambodia for the election, Trump had yet to name a new U.S. ambassador to the country. The president nominated a longtime State Department official to the job less than two weeks later. Following up by phone, I asked Ericksen if he had hoped to be named the next U.S. ambassador to Cambodia. Well, then — thank goodness that’s settled.